With the ASEAN Economic Community (AEC) looming in 2015, I thought it might be prudent to learn something more about the ASEAN before that date. There on the Bookazine shelves would appear to be the answer - a very slim volume (just over 50 pages) to explain ASEAN. Almost the definitive ASEAN for Dummies publication, or something similar. And the price was only B. 114. What a bargain! The book also proclaimed that this was the second edition, so there must have been a sell-out first edition one presumes. This second edition is also, rather strangely, only for Thailand (ISBN 978-616-215-022-7, Silkworm Books, Chiang Mai). The format is in Question and Answer style and covers the formation of the Association of South East Asian Nations (ASEAN), now of 10 members from the original five signatories in 1967, which were Indonesia, Malaysia, the Philippines, Singapore and Thailand. 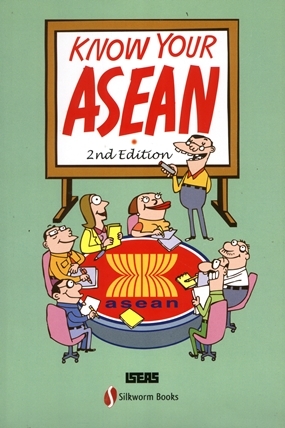 These ASEAN nations laid down seven aims and purposes for themselves and included economic growth, regional peace and stability, collaboration in economic, social, cultural, technical, scientific and administrative; mutual assistance in training and research; collaboration in agriculture, industry and communications and improvement of living standards and cooperation with regional and international organizations. All a very noble beginning. The other nations joined later, with the final three being Laos and Myanmar in 1997 and Cambodia in 1999. Question Five asks what have been the most important accomplishments of ASEAN, and proudly states that “No two ASEAN members have ever gone to war with each other.” This has been done by the system of Dialogue Partnerships, the ASEAN regional forum, the ASEAN Plus Three process and the East Asia summit. Perhaps the authors had missed the Preah Vihear conflict between Thailand and Cambodia which has been ongoing for 100 years and escalated in 2008 which resulted in several deaths in April last year? In 1993, the ASEAN ministerial meeting issued a long communiqué on human rights, which unfortunately is given lip service by many of the members. Remember the Tak Bai Massacre and the Kru Se Mosque incident for example? The much vaunted war against drugs must come in here as well. Lofty aims, but working? Hmm. I wonder. However, they have signed a pact to be nuclear arms free, so that is something I suppose. ASEAN has done some good, however, with common concepts on tourism, other than Thailand which has opposed a common visa for the region (like the European Shengen visa). The book poses the question, “What is ASEAN doing to combat international terrorism and other transnational crime, including the drugs problem?” The answer being that ASEAN members signed an anti-terrorism convention and written down a mechanism to counter the drug problem. With around 4,000 killed in the South of Thailand since 2004 and with many instances of cross-border movement of terrorists, one has to question the ability of the ASEAN convention. And drugs? The problem still exists, with the manufacturing sites being within ASEAN countries themselves. After wading through the rhetoric, it was impossible not to come to the conclusion that one was reading about all the ceremony without much of the substance. My local Bookazine in Big C Extra was having their stock-take, so I decided to re-run Private Dancer which I consider to be one of the most important books of the decade. Private Dancer, written by well known author Stephen Leather, has been a best seller in Bookazine for many years, and even though I reviewed the web copy, I felt that this book has been such a strong seller, I should review the paperback, which I now do again. It is a very cleverly fabricated story, relating to a journalist (Pete) who comes to Bangkok to work and who falls in love with Joy, a dancer at a bar in Nana Plaza. She is to become his ‘private dancer’ from which comes the title of the book. What sets this manuscript apart from the overdone ‘farang falls in love with bar girl’ books is that Stephen Leather gives the side of the central character Pete, and then follows that up with the thoughts of the girl Joy. After that, at various important milestones in the relationship, other people are brought in who give their impressions of what is going on. These people include Pete’s boss Alistair, the owner of a bar called Big Ron, whom Leather admits is well known identity Big Dave, and the bar called Fatso’s was Big Dave’s establishment called Jool’s on Soi 4 Sukhumvit (as anyone who has ever been there would pick immediately). Others who give their opinions include Pete’s friends, his flat-mate and even the owner of Joy’s bar, who is even more cynical than Big Ron. Where Stephen Leather has excelled with this book is in his understanding of the Thai viewpoint. And to then put it down in print. There will be those who will say that a farang can never get inside the mind of the Thais. Perhaps not, but this book of Stephen Leather’s must go damn close. Close enough for me! Take for example the words from Joy after Pete rang her in her room to say that he had been talking to Park, her Thai husband. “Park was in my room when Pete telephoned. I asked Park what he was playing at, and he said he didn’t know what I was talking about. I got angry then and said that he’d spoiled everything. He had no right to talk to Pete, he was my customer.” And it all hangs on that last word! If you have not read it, do so, and keep a copy for overseas visitors!